At Stark Headquarters in New York City, Sam crashes through the wall into the laboratory of Tony Stark. He immediately starts explaining to Tony that he's discovered his father is an imposter and needs Iron Man's help to find the real Jesse Alexander. Tony Stark explains that he can help find him and learn who the imposter is as long as he's able to get a signal on him. But the armored avenger is more concerned about Sam's family since the alien posing as Jesse knows where they live. Sam hadn't thought about that and blasts off at full-speed back to Carefree, Arizona! Arriving at home, Sam asks his mother if his dad was home. Eva tells him that she thinks he's at work. Her son explains that he isn't at work and isn't who they thought he was. He gives her the news about the imposter and that he doesn't know anything about the infiltrator's mission. Eva comforts her son and tells him that it isn't his fault. Just then, Sam's sister Kaelynn, comes down the stairs and asks where her dad is. One week later, Sam is helping Spider-Man, Ms. Marvel and the Vision build the new Avengers headquarters. 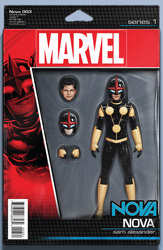 However, Nova has a hard time concentrating and doesn't hear his communicator beeping for his attention. The team allows him to leave to take care of his personal matter. As he steps outside, Sam runs into Iron Man who give his the information he's been able to find about Nova's father. Unfortunately, Tony Stark hasn't been able to find any trace of Jesse. 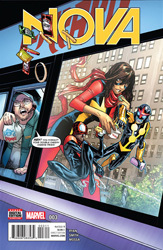 Back inside Avengers headquarters, Tony suggest that Spider-Man, Ms. Marvel and Nova go on patrol in the city. He feels it would be a nice break for them and give them the opportunity to grow as teammates. Later on top of NYC's Flatiron Building, the three heroes are eating lunch and talking about how they thought being Avengers would be more exciting. Suddenly, they hear screaming and look down to see small yellow creatures erupting from the street! As the young teens reach the ground, Ms. Marvel recognizes them as Moloids. They follow the fleeing creatures down into the subway system until they come upon a small hole leading far underground. They decide to follow the Moloids. At the bottom of the tunnel, the heroes are stunned to discover a large underground city! It appears to have been destroyed at some time with only a small lighted area in the center. They sadly realize the yellow creatures weren't attacking people, they were looking for food. Suddenly, the three heroes find themselves surrounded by a number of Moloids. The underground dwellers take the captives to their leader - the Mole Man! The Moloids's leader mistakenly believes the three Avengers are spies for his son. Ms. Marvel explains they aren't spies and asks what happened to his city. He reveals that his son has been waging a war on him. He also claims that he knows what to do with those who spy on him. In response, his Moloids bring out handfuls of a strange vegetation which gives off a green gas. The three heroes fall to the ground unconscious. When they awaken, the trio of Avengers find themselves in an arena with an enormous monster racing towards them!